Holi, the festival of colours is celebrated all over India with great enthusiasm. Some of us, may be busy in the religious festivities, while others might just want to splash colours. In India, celebrations of Holi reflect the country’s diversity. From traditional practice of beating men to DJ parties, Holi is a whole lot of tradition and fun. We recommend you some places across India that have unique Holi traditions. Laathmar Holi is celebrated by the women of Barsana in Uttar Pradesh by beating up men with sticks or lathi. It is believed that Lord Krishna visited the the village of Nandgaon and Barsana to meet his consort Radha. Krishna, known for his mischief teased Radha and her friends (gopis) and he was hit by the them. This notorious incident gave rise to the unique ‘laathmar holi’. These celebrations begin a week before the actual celebrations of Holi. A day before lathmar holi, ‘ladoo holi’ is celebrated wherein laddoos are thrown at each other. The celebration of Holi in Shantiniketan was started by the famous Bengali poet and Nobel Laureate, Rabindranath Tagore. Inspired by the spring festival and colours of Holi, he introduced this festival as an annual event in the city. Students from the university dress up in spring colours and put up extensive cultural programmes for tourists, including Tagore songs and dancing. In the temple of Mathura & Vrindavan, celebrations begin close to 40 days before the actual date of Holi. Lord Krishna is said to have been born in Mathura and spent most of his childhood in Vrindavan. In Mathura, the area in the vicinity of the Holi gates is the main hub for celebrations and involves a long procession with music, water and colours, from the temple all the way to the river. In Vrindavan, the week-long celebrations at Banke Bihari Temple are nothing less than legendary. In this capital city, there is an air of music and madness. 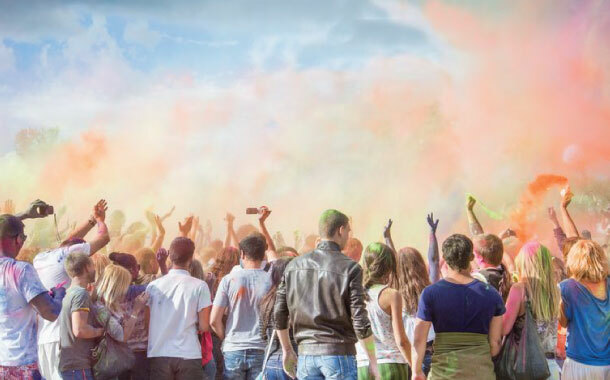 There is a chance that you will be covered in colour and splashed with water by shopkeepers and children alike, but out of the streets and into the various lounges and pubs in Delhi, there will be a host of events from rain dance and non-toxic colour splash to popular DJ jamming sessions. Be prepared to chug a couple of bhaang lassis and enjoy a wide array of snacks. So, what are you waiting for? Get your domestic flights booked at the earliest and indulge in the festivities of Holi this year.